Other Products by PrimaForce. Search other ZMA Supplements products. ZMA is a pro-anabolic formula produced by a proprietary manufacturing process, containing highly bioavailable forms of zinc and magnesium. 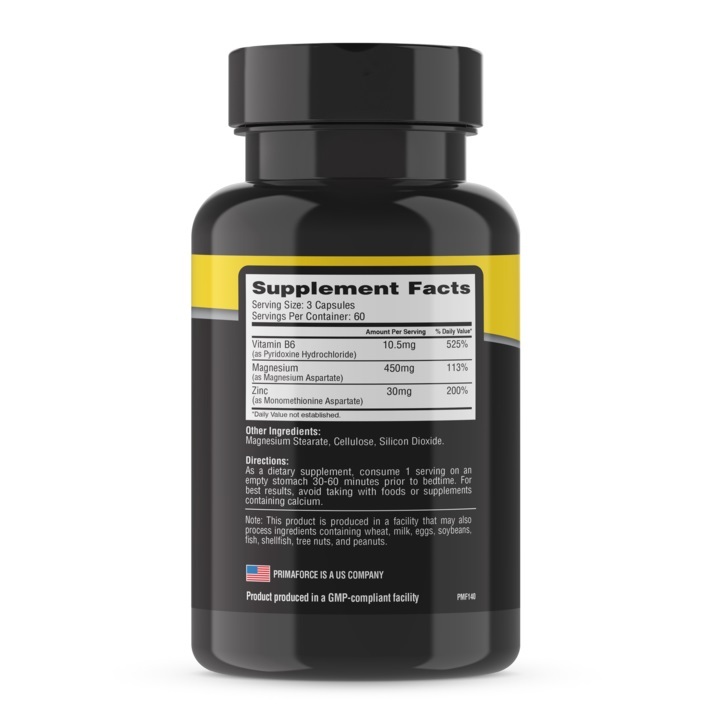 Formulated with vitamin B6 to further enhance zinc and magnesium absorption and utilization, ZMA is a powerful non-steroidal, all natural dietary supplement clinically surmised to increase free testosterone, total testosterone and insulin-like growth (IGF-1) levels and to enhance muscle strength significantly greater than placebo during a strength training program. As a dietary supplement consume 1 serving on an empty stomach, approximately 30 - 60 minutes prior to bedtime. For best results avoid Primaforce ZMA with foods or supplements containing calcium. INGREDIENTS: Cellulose, Magnesium Stearate, Silicon Dioxide. MAY CONTAIN: Milk, Eggs, Soy, Fish, Shellfish, Tree Nuts and Peanuts.